Building walls instead of knocking them down! When I was leaving school we were all used to the idea that divisions between people were coming down. In the autumn of 1989 when I was 15 and readying for my end of school exams the Berlin Wall came down and within a matter of weeks the nations of eastern Europe finally became free. I very much remember the revolution in Romania completing the cycle on Christmas Day and as I sat writing my homework (I was a very diligent child) little did I know that the actions of that day would allow me to meet my dearest future wife. All this was proof that the world was moving in the right direction, Iran and Iraq made peace, Nelson Mandela came to power in South Africa and there was even whisperings of peace in Northern Ireland and Israel-Palestine. Sadly in the last few years more walls have been built than torn down. Walls have always been used to keep out enemies and undesired people. From The Great Wall (or several smaller walls) of China to Hadrians Wall in northern England, across the globe walls have been used to separate people. The reasons they are being built today are very similar to why they were built thousands of years ago. The reasons are just as valid or invalid as they ever were and they remain an easy option compared to tackling the real problem lurking in the background. 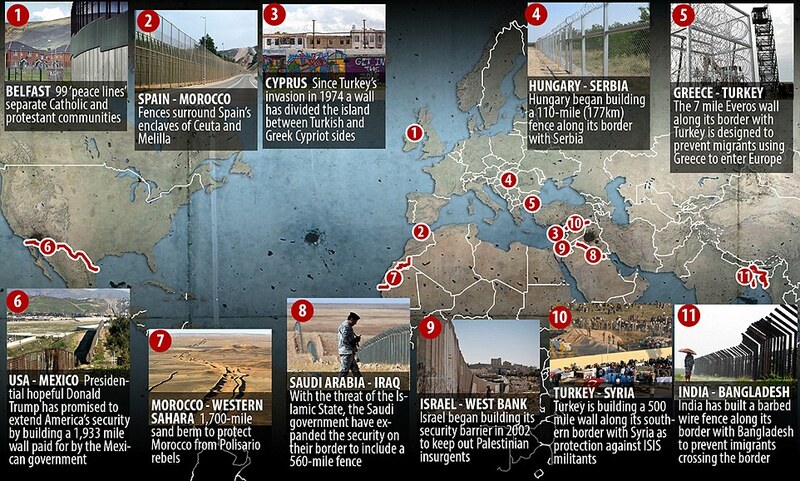 Maps of major divisive walls, courtesy of the Daily Mail newspaper. We in the U.K. are far from faultless in this respect with a number of walls and high fences installed in Belfast and other cities in Northern Ireland. At least in this respect, they were at least put up to keep the peace and with the general support of people on both sides of the religious and physical divides. Northern Ireland has had peace for 20 years but despite a clamour for the walls to come down, they still remain with many residents of both faiths fearful of there neighbours. The walls don’t stop anyone reaching any part of the city, they just mean local youths can’t easily cause trouble. Sadly until the children of both sides actually meet and learn together, its hard to see these walls coming down. We also have a series of new fences being built around Calais in northern France, this time to keep mainly economic migrants out of the country. Similar and much bigger barriers have been put in places in much of the world. Whilst Spain keeps demanding the return of very wealthy Gibraltar, they protest rather less about their small fenced off territories in Morocco, Africa which are a focal point for African refugees seeking a better life in Europe. In Eastern Europe, Hungary is busy building a long fence to keep out economic migrants from Serbia. It is interesting given what I wrote last week about whether poorer countries are any more open to letting migrants enter their nations than richer nations like the U.K. or U.S.A that in the case of Hungary, they certainly don’t seem to be. Greece also has a 7 mile fence along its border with Turkey to keep out migrants whilst even India which many people would believe not to be a rich nation, has a fence to keep the much more impoverished migrants from Bangladesh out. Lastly but not least is the increasingly fortified border between the USA and Mexico with Presidential hopeful Donald Trump wanting to build a 1,900 mile wall to keep Mexicans out and all paid for by the Mexican government! These walls are largely all being established for economic reasons but also to preserve the culture and identity of the nations behind them as well as protecting the quality of life too. Whilst having impenetrable barriers will deter many from trying, the only way to truly resolve the problem though is to improve life for those leaving their homes behind. Not all barriers are to keep migrants out. Some are for security, or at least that is what we are told. Turkey is busy building a barrier along its border with Syria, to keep ISIS terrorists out whilst happy to bombard the Kurds who are the only people fighting the terrorists. Morocco has built a large barrier to keep rebels out after in invaded the nation of Western Sahara decades ago. Some barriers, perhaps a little like those in Northern Ireland today are actual objects of comfort and security. Take the extensive barriers that run throughout Cyprus from the Turkish invasion of Greek run Cyprus. The minority Turkish community voted in favour of creating a united Cyprus by a margin of 65%-35% only 24% of the Greek majority supported the plan with security being one of the major issues. All of these security barriers are just plastering over the real problem and unresolved issues and if they stay unresolved for long enough then it is quite possible for a quiet festering unhappiness to erupt into a major uprising. Perhaps the most prominent security barrier is that of the one Israel has constructed in the West Bank. Understandably wanting to keep Palestinian terrorists out of its land is one thing but the Apartheid Wall as the Palestinian call it, was largely constructed deep in Palestinian territory and impoverished countless communities whilst all the while not dealing with the key issues. The International Court has ruled that the entirety of the wall should be on Israeli soil but as it is 13.5% of Palestinian land has been effectively annexed behind the wall. Shutting people out is the easy part, helping them so they don’t need or want to leave their home-lands is the hard part. What’s clear that it isn’t just a problem between the very rich nations and the very poor but rather between any nation which is noticeably richer or more desirable than its neighbours. If another penniless migrants enter a rich country than eventually the rich nation will also be dragged down so surely helping the poor nations are a better and only permanent solution for all. The route of the Israeli security barrier. Map by Wickey-nl on Wikipedia. This entry was posted in geography, history, Politics and tagged borders, Calais, Cyprus, Donald Trump, history, immigrants, Israel, Life, migration, Palestinians, People, walls, war. Bookmark the permalink. 2 Responses to Building walls instead of knocking them down! This is so sad. Walls create not just barriers but quarrels. Where I live boundary differences have caused the greatest amount of legal cases and more. If local farmers from the same families can’t agree between themelve there seems little hope for the world and its mega-problems. Peace seems as far off as ever, indeed further off than ever. Is there ever going to be a vaccine against this human disease? Another great article. Its funny. Watching the Republican debates, all they want to do is to build walls to keep migrants out. And now this situation in Eastern Europe with refugees from Syria – and the walls going back up again.